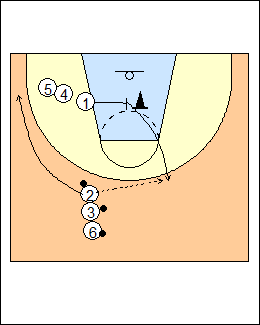 Work on where they get their shots from, see Offence - Dematha flex, also Attack/defend - Dematha flex 2 on 2. Use a chair as a flex screen above the block (or cones). Cutter 1 steps high then cuts low under the screen, catches a pass from 2, and finishes with his left hand (his defender will be trailing, don't expose the ball by finishing with the right hand). Both players change sides (the shooter rebounds), 4 is the next shooter. Continue then change sides. 2-3-6 can be one team, 1-4-5 another team (all players on one team shoot, then the other team shoots). 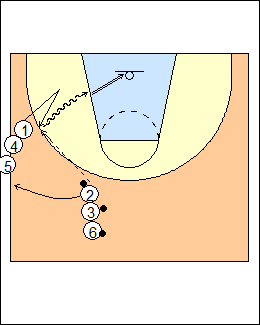 See Shooting - Continuous (post-entry). 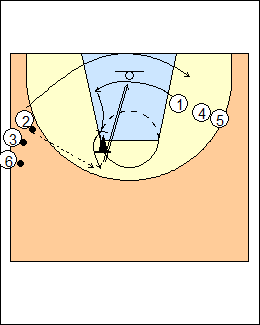 1 pretends to cut off a flex screen, pauses, sets an upscreen on a chair, pauses (a cutter would go by), steps to the other side of the chair for a 16-foot jump shot (don't turn your back on the ball). 1 sets a block-to-block screen then cuts to the foul line or 3-point line for a shot (his defender will have to help on the cutter, giving him a split second to get a good shot). Progression - shot fake, rip through going right, one dribble. 1 steps in, steps out, catches, rips it through with one dribble for a power jumper off the glass at the block. 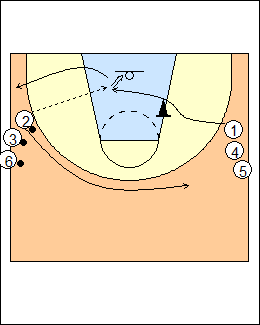 If 1 has a weak defender, he will rip through as soon as the upscreener vacates, if help comes he can pull up for a shot, make a simple pass to the help's man, or skip it to the weakside wing if a defender helps the helper.